Apparently I don’t have issue #3, although given yesterday’s comic was in the wrong spot who knows? Lady, that is a terrible outfit for flying. Elisa’s sister ends up at the Sacrilege nightclub, where she is the target of some bad dudes, but rescued by Broadway. After Beth leaves he is met by Lavonne, the girl who was kidnapped in issue #2. Only now Gen-U-Tech made her into some kind of vampire creature. While she was supposed to drain the blood of a gargoyle and gain a sample, she instead seeks revenge on Xanatos and Dracon’s people, but ends up forming a bond with Broadway. However, she also has an effect on the other gargoyles the next night, though Hudson puts a few things together and figure out she’s the killer vampire. Out of her influence, Lexington and Brooklyn stop fighting for her attention and let their brother off with his new love, but she tries to kill him, unable to fight her urges any longer. When the sun rises Broadway turns to stone while still holding Lavonne while trying to stop her. When he wakes all he’ll find is the skeletal remains of the poor girl. What they got right: Cute joke with Hudson (played by Ed Asner in the series) watching The Lou Grant Show (although it was just titled Lou Grant and oddly not a comedy despite the character coming from The Mary Tyler Moore Show). For what she’s supposed to be I like Lavonne’s character model. It fits her story perfectly, and you do feel sorry about what she went through and how she dies, as well as feel sorry for what you know Broadway is going to be dealing with when night falls. What they got wrong: A bit dark for my tastes mind you. I do have one problem with her design, and I mentioned it in the caption gag. That is not a good outfit for flying in. And the two of them just going to White Castle (yeah, I got that joke too) and Nathan’s Hot Dogs? Yes, Broadway makes a comment how people are just willing to get them out and not even having them pay, but that seems weird too. Finally, the narration keeps bouncing between Elisa’s diary and the regular narrator out of necessity since she’s barely in this story (this is Broadway’s tale) so why not drop her narration and just stick with the regular narrator? Recommendation: I’d actually keep this one if it wasn’t so dark. It’s not my kind of story, but it does sort of fit the style (if not the tone) of the show. It’s worth looking into despite its flaws. 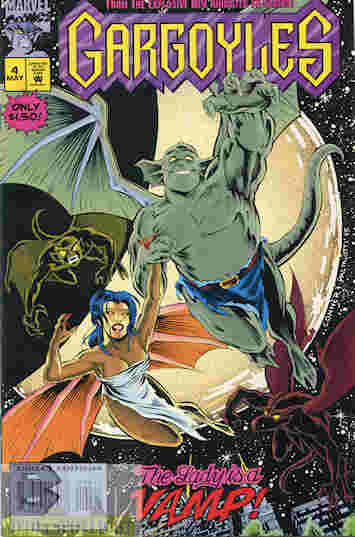 Posted by ShadowWing Tronix on January 31, 2018 in Animation Spotlight, Television Spotlight, Yesterday's Comics and tagged Broadway (Gargoyles, Gargoyles, Marvel Comics. Wow! That looks more like an outfit for dancing in a nightclub. I’m going to check out those MOTU videos (ones you posted on Saturday) on Friday, the only night where I don’t have consistent shows that I watch between 8 and 10. I also still want to watch that video about the video game character that came from a Japanese legend. And see your friend’s link to Gargoyles. Those three things are on my list for Friday and Saturday. Well, she was kidnapped from a nightclub but that wasn’t what she was wearing.